Sense of humor = boundless! Moving to a new school can be nerve-wracking, especially in junior high when you don’t know anyone and you don’t have any arms to wave hello or shake hands… but Aven will carry on regardless of the stares. Just released this week, Insignificant Events in the Life of a Cactus showcases Aven’s curiosity, self-sufficient attitude (thanks to her parents), and witty storytelling as she leaps (or tiptoes) into new situations in her new town and school. How do you treat new folks who are different from you? Book info: Insignificant Events in the Life of a Cactus / Dusti Bowling. Sterling Children’s Books, 2017. [author site] [publisher site] Review copy and cover image courtesy of the publisher. My book talk: Moving across the country, 13-year-old Aven wonders whether living in Arizona will be more difficult because she has such fair skin or because she has no arms. Her adoptive parents have encouraged Aven to do everything for herself – button her jeans, brush her teeth, play the guitar – and she can. Dad really needs a job, so off they go to Arizona where he and Mom will manage an Old West theme park, and Aven will start 8th grade without the longtime friends who are used to her crazy stories about where her arms went, knowing she was born that way. Eating with her feet (of course she washes them first!) in front of new kids? Yikes! Better after meeting Connor, who never eats in front of anyone because of his Tourette’s tics, and Zion, who eats by himself so kids don’t tease him about being big. Uncovering the mystery of the missing Cavanaugh photo and the secrets in the locked shed? Just takes persistence and clue-gathering by Aven, Connor, and Zion. And a crowbar. And the right key. Making sure that Stagecoach Pass park stays open? She’ll have to think on that a while. Ancient saguaro cacti that guard the hilltops near the park, tarantula photos on the ice cream parlor walls, upcoming soccer tryouts – interesting opportunities for Aven, whose blog posts shout and whisper the happy and challenging parts of her new life. Desert Dark, by Sonja Stone (book review) – school for spies, time to die? Whoa! Full tuition for boarding school for math genius problem-solvers? And across the country from her cheating boyfriend, too? Best idea that cryptographic whiz Nadia has heard in a long time, till she arrives at… a secret Black Ops academy, funded by the CIA, with a killer double-agent on campus! The first chapters (provided here free by the publisher) set up the dangerous world that Nadia finds herself in. How far can you run from heartbreak? Book info: Desert Dark / Sonja Stone. Holiday House, 2016. [author site] [publisher site] Review copy and cover image courtesy of the publisher. My book talk: Recruited for an exclusive boarding school where her math abilities will be prized, Nadia discovers that Desert Mountain Academy covertly trains students for CIA black ops careers. When rumors of a double-agent on the remote Arizona campus prove true, suspicion falls on the newly-arrived Virginia teen whose mother is Lebanese. Nadia is overwhelmed with martial arts and Mandarin, trying to master firearms and survival skills with the other juniors in her team – and resisting her attraction to their senior leader, Jack. Teammate Damon is willing to help her catch up, but socially-challenged Alan (grandson of a Jewish Mossad agent) is openly skeptical, sure that she’ll bring down the team. Her germophobic roommate Libby is hiding something – is it about the girl whose death opened a spot for Nadia after the semester had begun? Chapters by Nadia, Libby, Jack, and the mysterious double-agent tell of assassination attempts (yep, plural), gradual team bonding, survival training, academic challenges, and a growing romance – if Nadia can survive her first year at Desert Mountain Academy! Kate will track down the killers in the unforgiving Arizona deserts and mountains to avenge her father’s death, but when the 18 year old discovers that the gang is after the gold that her father hid, look out! Read chapter one here (courtesy of the publisher), then hunt down this wild Western tale at your local library or independent bookstore! We need girls with grit in westerns and all kinds of books – Kate is as gritty and tenacious as they come. Family secrets… shared any lately? 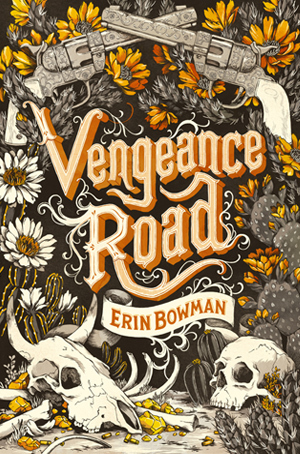 Book info: Vengeance Road / Erin Bowman. [author site] [publisher site] [book trailer] Review copy and cover image courtesy of the publisher. My book talk: Kate’s riding hell-bent for leather on the Arizona frontier to avenge her father’s murder, as she follows the treasure map that he hid for her, ready to kill every member of the Rose Gang… as long as they don’t get her first! Apaches and dust storms, the Superstition Mountains and a secretive old miner, Pa’s mysterious and cryptic map… Kate’s trail is perilous and bloody. If Kate’s heart is consumed by vengeance, will there ever be room for anything else? 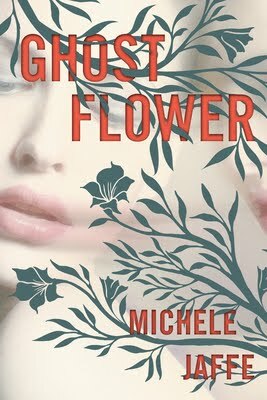 G for Ghost Flower, by Michele Jaffe (book review) – missing heiress, ghostly best friend, forever? the one who will inherit millions on her birthday this month. What could go wrong with a short-time acting gig? With no roots and no need to be protected, Eve is even more like the desert’s ghost flower than Aurora was. Perhaps that’s why Bain and Bridgette chose her to fill in as their missing cousin, so it’s that much easier to sweep her away later and let The Family’s money flow to those who appreciate it and badly want it?? reminding her that they’re best friends… forever. Grab this page-turner at your local independent bookseller as soon as it’s published on April 12, 2012 – and once you get to the halfway point, plan on staying up late to finish it. Book info: Ghost Flower / Michele Jaffe. Razorbill, 2012. [author’s website] [publisher site] Review copy and cover image courtesy of the publisher. My Book Talk: Oh, she looks just like their missing cousin! Two rich teens offer Eve a chance to break out of poverty. Just convince the family that she really is runaway Aurora, come home in time to collect her inheritance, then conveniently disappear again once she’s given most of the money to them. What has she got to lose? Maybe it’s time for her to take a chance on a better future, one far away from Tucson and the troubling flashbacks to terrible times in foster care which have increased since she moved here. Studying photographs of Aurora’s relatives and school friends, eating only her favorite foods, wearing only her favorite colors – Eve is being transformed into wild, crazy Ro under the exacting instructions of Bridgette and Bain, secluded in a desert hideaway. Bridgette has Aurora’s return to Tucson society meticulously planned for the week of her high school’s graduation, just before the memorial to its two lost classmates – Aurora and her best friend Liza, who committed suicide on the night that Ro disappeared. But the new Aurora has her own ideas for convincing everyone that she’s the real deal and jumps back in early, encountering a psychic medium with a chilling message at a graduation party séance, a police officer who believes her memory is gone but sees her sorrows too well, and eerie phone calls day and night – from Liza! Glaring omissions in the detailed information that Bain and Bridgette provide Eve to study – do the cousins want Eve to succeed or fail in her attempt to convince her wealthy grandmother, the rest of the Sterling family, and Tucson’s high society that she truly is their wild, impetuous Aurora? Ghostly phone calls from Liza – can the dead truly communicate with us? Who is she warning Eve about? Why don’t all the puzzle pieces surrounding her death fit together right?